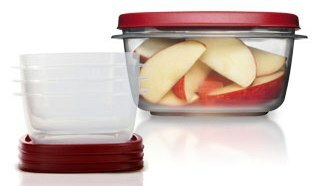 For the last few months, I have been trying out Rubbermaid’s new storage containers with the Easy Find Lids™, and I must admit – I’m hooked! Although I’ve always been a fan of Rubbermaid products, these new containers seem custom-made for us New Yorkers with our limited cabinet space. They nest inside each other. Stacking up four containers takes not much more room than one. They snap to their lids, and the lids snap to each other. You can snap the lids onto the bottom of the containers. No more searching for lids! They are beautifully transparent. You can see right away what is stored in them, taking away all the guesswork. Produce Saver™ keeps fruits and vegetables fresher and crisper due to a vented lid and a slotted tray that sits at the bottom of the container. I emptied my bag of baby carrots into one of these, and every time I open the refrigerator, I have a healthy snack staring me in the face. Lock-Its™ features four locking tabs for an extra secure lid seal. This is great for storing soups, stews, and other heavy contents, as well as for anything you take on the go, as we New Yorkers are known to do. Premier™ are stain and odor resistant. Use these for tomato sauce and other staining foods. I love that the Premier lids are transparent, further removing the guesswork of storing leftovers and such. You can mix and match the containers and the lids. Despite the four different types, any of the lids will fit any container of that size. That appeals to us New Yorkers for don’t have the room to store specialized items. Find out more about Easy Find Lids™ at this helpful website.